Dame Ursula welcomes the visits of a kindly blacksmith to her crippled grandson, Conrad, but soon becomes suspicious that the blacksmith and his friend, Ned Trueman, are followers of John Wycliffe and his evil "heresy". Conrad, meanwhile, wonders why all the remedies of the Church fail to cure him, and also why he doesn't have a father like other boys. 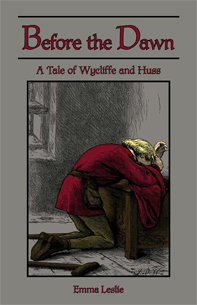 As he studies to become a famous Doctor of the Church, Conrad has the opportunity to hear Wycliffe preach, and then when he returns to his native Bohemia, he learns of the preaching of John Huss as well. Will Conrad accept these dangerous new ideas of Wycliffe and Huss? And will he ever find out what happened to his father? Story Setting: England and Bohemia in 1382 - 1453 A.D.